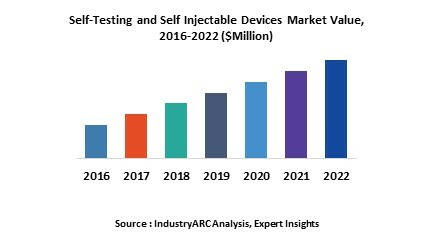 Geographically, North America dominated the self-testing and self injectable devices market, with approximately half of the world’s consumption being done in the U.S. because of higher healthcare expenditure, medical reimbursement facilities, advanced technologies, and huge investments undertaken by prominent as well as new market entrants. Asia Pacific is projected to have the fastest growth, owing to a rapidly increasing aging population, rise in consumer awareness, favourable government policies, modernization of healthcare infrastructure, and growing medical tourism industry in developing nations such as China, and India in this region. Among all the products, Blood Glucose Monitoring (BGM) has the fastest growing rate in the self-testing and self injectable devices market due to higher prevalence of diabetic patients.